There's a war being fought against a very unlikely foe: sulfur. It's a fight being waged by every developed nation in the world. And there are only a handful of major producers around the world making the ammunition to combat this enemy. I mean, you’d think they’d design these trucks with some kind of closed cage on the bed so those gas cylinders don’t go flying out the top, right? But what do I know about road safety? Nothing. Safe enough, I guess. I do know, however, that these cylinders are part of a $130 billion global industry that’s still expected to see an +8% CAGR globally over the next decade. 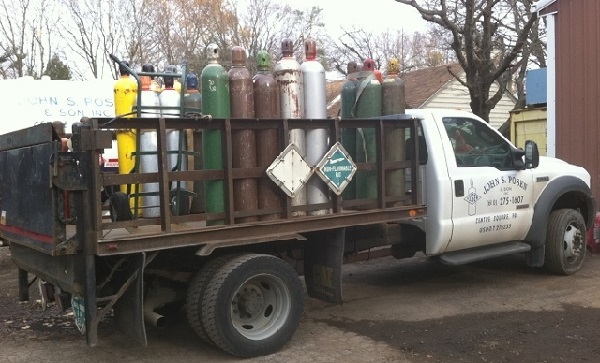 Well, a lot of different industrial gases. There are a huge number of different industrial gases and mixtures that touch almost every aspect of our lives, even if we don’t appreciate it. I'm talking about gases like hydrogen, oxygen, nitrogen, carbon dioxide, argon, helium, and acetylene. The American Chemistry Council says industrial gases are used by industries that account for 25% of American GDP. And their production is part of the wider chemical industry. Industrial gases are used in chemical manufacturing, food processing, medical treatment, metal processing, water purification, fertilizers, nuclear power, electronics, and aerospace. Oxygen is used in steel-making and metal cutting. Nitrogen is used to create an inert atmosphere for storing food. Acetylene is used for welding. Carbon dioxide is used to make carbonated drinks like soda and beer. Methane is used in plastics, fertilizers, and more. We use industrial gases from cradle to grave. Industrial gases are used to entertain children with helium-filled balloons and give medical oxygen to the elderly with conditions that interfere with breathing. But the primary end user for industrial gases is the energy industry. And the primary product in demand from the energy industry is hydrogen. The demand for hydrogen fuel cells is growing. But that's not really what the energy industry is using hydrogen for right now. Sulfur in gasoline impairs the effectiveness of emission control systems and contributes to air pollution. Reducing the sulfur content in gasoline enables advanced emission controls and reduces air pollution. 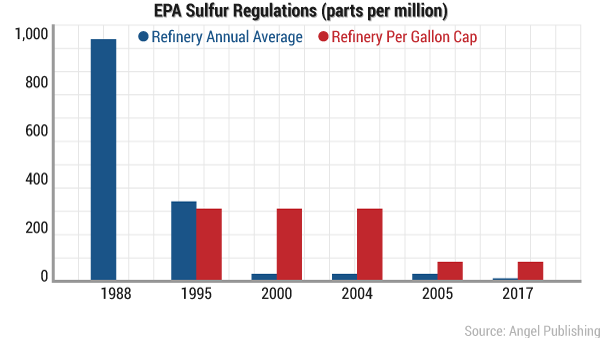 In the late 1980s, the EPA's regulations allowed refiners to produce gasoline with an annual average of up to 1,000 parts per million of sulfur. But by the mid-1990s, the EPA began to significantly decrease the amount of allowed sulfur, and in 2017, it set a standard of 10 parts per million. It has been a 99% reduction since the late 1980s. But the fight against sulfur in fuels continues in the United States and worldwide. And right now, the focus is on reducing sulfur in marine fuels. The International Maritime Organization (IMO), a specialized agency of the United Nations responsible for regulating shipping, has been working to reduce sulfur in marine fuels for years. 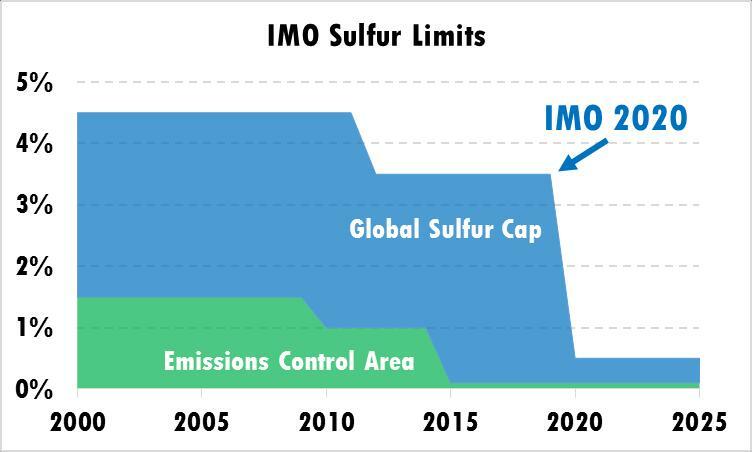 Since 2000, the IMO has lowered sulfur caps in marine fuels from 4.5% to 3.5%. And in 2020, the IMO will begin to require that refiners produce marine fuels with less than 0.5% sulfur. As a result of increased regulations against sulfur content in fuels, global demand for hydrogen is expected to increase. According to a recent report published by Market.us, the global hydrogen market is expected to grow at a CAGR of 8.4% through 2028. Now, oil refiners produce some of their own hydrogen, but not enough to meet their demand. So they need to buy it from companies that produce the gas. And that's where our ammo makers come in. The industrial gas industry is controlled by a handful of large companies controlling significant global market shares. Linde plc (NYSE: LIN) is the world’s largest industrial gas company. The company’s current incarnation is the result of a 2016 merger between engineering firm Linde AG of Germany and industrial gas provider Praxair of the United States. Today, it’s a huge company with 60,000 employees in over 100 countries and commands an $88.5 billion market cap. 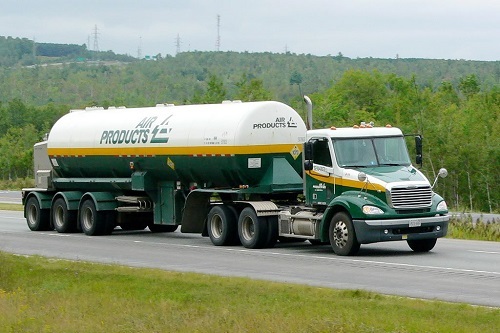 Air Products and Chemicals (NYSE: APD). You might have seen its logo and/or its trucks. APD is a Pennsylvania-based industrial gas firm and one of the largest, controlling about 10% of the global market share. Air Products and Chemicals produces a variety of gases including hydrogen, oxygen, nitrogen, carbon dioxide, argon, helium, and acetylene and serves the energy, technology, medical, food, and industrial markets worldwide. APD's revenue has been up and down over the past 10 years. The company suffered falling revenue as a result of the fallout of the 2008 financial crisis. But it also saw falling annual revenue from 2011 ($9.6 billion) to 2015 ($7.5 billion). Since then, revenue has picked up. Last year, APD recorded $8.9 billion in revenue. Of course, it's important to do your own due diligence. But I think APD is a great stock for long-term holding.